Can't believe that this is my first beer review since landing in Montreal on Thursday. I've drank an insane amount of beers and hung out with some amazing peeps (Unfortunately no dates with cute French girls.. ah well!) I've tried so many beers that I don't remember what my favourite was. 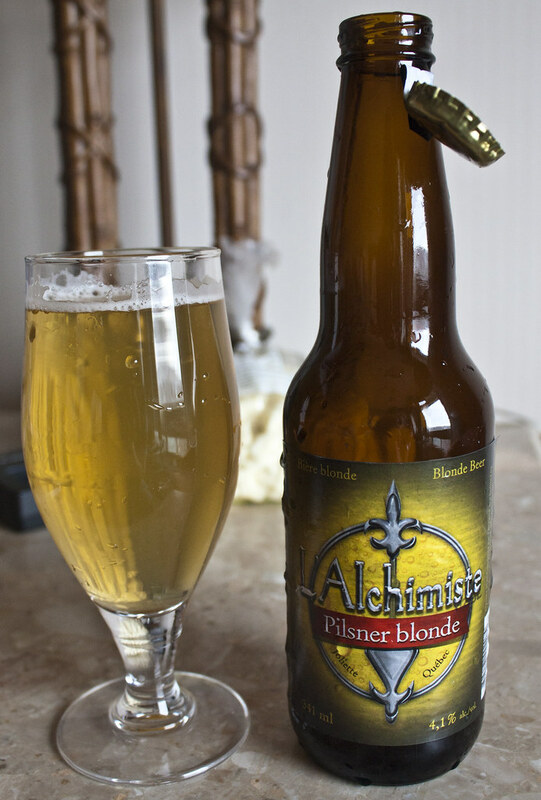 I'm not a fan of pilsners but Alchimiste's Pilsner Blonde is very solid. Appearance: Pours a cloudy light straw golden yellow, quite light in appearance, minimal amount of snow white head. Reminds me of a Fort Garry unfiltered Frontier pilsner. Aroma: Not your standard Canadian pils, it's lightly hopped, a grainy maltiness and an incredible amount of citrus zest of lemon. Very solid springtime pilsner. Taste: At only 4.1%,this beer is a good session-style pilsner, it's sweet, a nice amount of floral hops, a bit of a bitterness that lingers on the palate, and lots of barley notes. Hard to say no to this beer! Overall Thoughts: Incredibly solid pils, a bit yeasty, sweet, and perfect for spring time patio weather. No corniness at all.